Thanks to AFM I had a digital copy of this album at my disposal but didn’t bother listening to it because I wanted to actually buy the CD because I’m a fan of Oliva’s vocals and early Savatage albums. I’ve listened to it a number of times and have been sitting on this review for quite some time. I think Savatage itself is an acquired taste but there’s just something about Jon’s work outside of Savatage that I have a hard time getting into. I didn’t think Doctor Butcher was all that great and I felt the same about the debut JOP album ‘Tage Mahal. After that initial disappointment, I didn’t bother with 2006’s Maniacal Renderings. I had good intentions to pick up 2008’s Global Warning because the reviews were so positive but I never did. 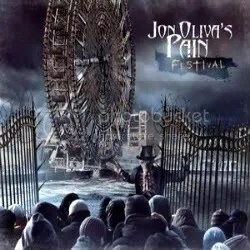 Well, I finally get around to picking up another “Pain” album and it’s actually pretty decent and I’m enjoying much more than the first release. With the continued success of Trans-Siberian Orchestra, a reunited Savatage is unlikely anytime soon so by Jon’s own admission this is about the closest to Savatage as fans are gonna get in terms of sound, if not band members. I have to say that I agree when it comes to Festival, there are many Savatage worthy moments to be found on this disc. Most of this album is very dark & heavy throughout, there’s not a lot of melodic, mid-tempo numbers and that’s a good thing in my book because that’s when Jon begins to lose me. The album only slows up for the ballad “Looking For Nothing”, goes mid tempo for “Winter Haven” (though that song starts to get a bit heavier towards the end) and “Now” sounds like a lost TSO song complete with orchestrations. The rest of the album features Jon’s trademark wail (with hasn’t lost a step over the years) and some nice heavy riffs. As with previous albums, many of these songs were developed with or based around ideas and recordings Jon had kicked around with his late brother Criss (along with a few unused TSO ideas too). The song “Festival” has parts going all the way back to 1979! If we can’t have Savatage, Festival is a good consolation because the spirit of that band lives on within these songs. The CD is an “enhanced” one, featuring live clips, video footage with Jon talking about the album, photos and wallpaper. This is the debut from Jon Oliva’s post-Savatage band and I was pretty excited to get this album. I think I picked it up about a year or so after its release, but I was becoming a big Savatage fan by that point. I’ve seen plenty of reviews claiming this to be basically be an unofficial Savatage album and I suppose that’s true, but it doesn’t hold a candle to earlier Savatage releases. Or so I thought when I first heard it. Honestly, I thought the album was garbage and I gave it only a few spins before throwing it into my ever-increasing pile of CDs soon to be forgotten. I much prefer what-you-see-is-what you get heavy metal of their earlier years over the dramatic, melodic stuff they would later go on to do. From Streets onward, they’re just a totally different band to me that I have no interest in, so expectations were high for ‘Tage Mahal now that Oliva was on his own (even if O’Neill hung around as producer). Looking back, it isn’t as bad as I remember it being because there are a number of bright spots. The problem I have with the album really boils down to Paul O’Neill, I think. The album is too melodic and there are too many slow spots and it’s just overproduced and too majestic sounding for its own good at times. I’ve read later Savatage described as “Broadway metal” and I guess that fits because this album is a follow-up of that era of the band and not their earlier sound. It has that TSO vibe to it, which is fine for TSO but I’d rather Oliva got back to his heavy metal roots for this one. Call it thumbs in the middle for this one. A few songs show some heavy metal fire, but the rest is a bit pompous and bloated. Many of these songs were fleshed out from incomplete works that Jon had worked on with his brother, the late Criss Oliva.